My household is a true fan of nachos. I’m not too certain whose household is not a fan of nachos. As I have made pizza nachos, Idaho nachos, chicken mole nachos, a simple nacho with cheese and jalapeno peppers, and one that I call the ultimate game day nachos, I recently created something truly special, and amazing at that. I created a nacho potato skin. To me, a potato skin is a perfect vehicle in delivering everything you want in a bite of food. This nacho potato skin was just that. It was everything you love about nachos in a couple of bites. Begin by preheating your oven to 400 degrees. Poke the top of each potato with a fork and place on a baking sheet. Cook in the oven for 1 hour. Once cooked, remove from the baking sheet, and place on a plate to let cool for about 15 minutes. Once your potatoes are cooled, use a sharp bread knife and you will cut lengthwise, into three segments of one potato, long slices. So each potato will yield two skins, right? Discard the middle slice and reuse for breakfast the following morning, or heck for that matter, add some butter, salt, and cream, and make some rustic mashed potatoes. Continue this cutting process with the rest of the potatoes. You should then have 6 skins. With a small spoon, being careful, scoop out about 70 percent of the potato, as you still want some potato in your boat. Next, melt your butter in the microwave. Get your broiler heated to high. 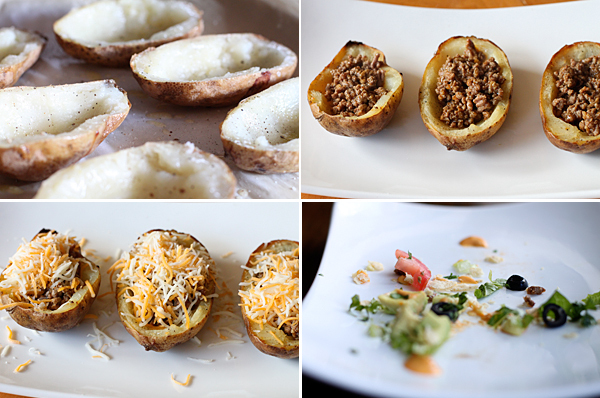 Brush the butter on the inside and outside of each potato skin and place them back onto the baking sheet. Season the inside of each skin with salt and pepper. Remove them from the oven, and fill each one with a bit of ground beef, and shredded cheese. Place back in the oven and cook another couple of minutes until the cheese is nice and melted. Remove them once again, and fill them up with shredded lettuce, tomato, black olives, and avocado. Crumble nacho chips over the top of each one and drizzle the warmed cheese all over the top. Again, place them back in the oven and cook until the cheese is nice and melted. Remove them from the oven, sprinkle with a bit of salt, and plate them up. Take a picture. Just kidding. Dig in. Each bite is filled with awesome nachoness. Is nachoness even a word? Seriously, make these. 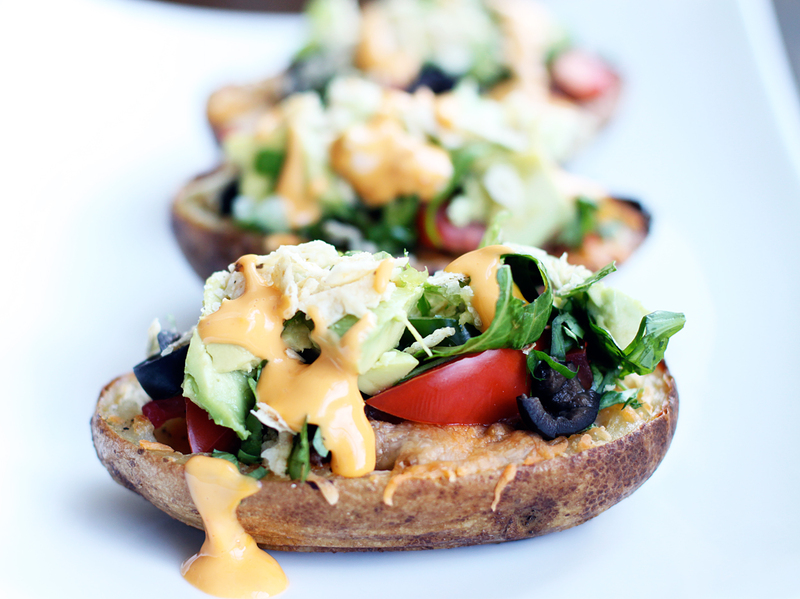 If you are a fan of nachos, you are going to be a huge fan of these nacho potato skins. A new take on a potato skin. Continue this cutting process with the rest of the potatoes. You should then have 10 skins. With a small spoon, being careful, scoop out about 70 percent of the potato, as you still want some potato in your boat. These look perfect!! Can’t wait to make them.